Easily one of the finest rural runs in America, this 78-mile delight borders the Greenbrier River as it weaves its way through thick forests, open fields, and two tunnels. 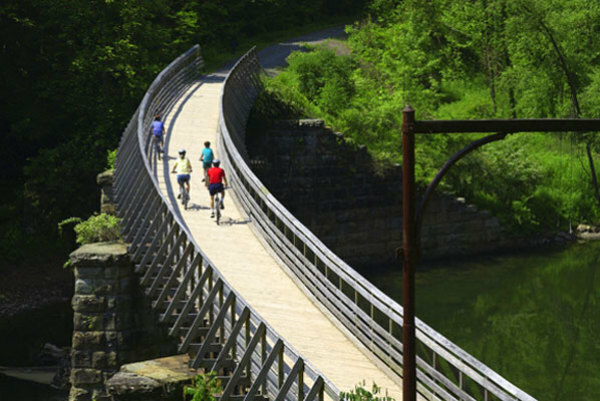 Deep in the heart of West Virginia, the hard-packed gravel route introduces you to such relics of railroad history as restored depots and vintage mile markers from the old C & O Railroad that used the line to haul timber. It’s not unusual in these parts to spot ospreys, bobcats, even black bears in the woods. Start at the northern trailhead in Cass for a good downhill cruise and plan on bringing lots of water and food, since there are few places to stop on the trail. Near Marlington, you’ll ride through Sharp’s Tunnel, a 500-foot-long passage hollowed out from stone in 1900, and emerge onto a wood-slatted bridge that hovers some 30 feet above the rushing river. Stop in town to see the historic railroad depot (built in 1901) and the bright red caboose before pushing on to Watoga State Park, the trail’s halfway point. You can camp here overnight, go swimming, or fish on the river for trout and small mouth bass. South of the park, you coast through Droop Mountain Tunnel, riding along a remote river and its dramatic red shale cliffs. The final 34 miles from Rennick to Caldwall is a peaceful jaunt through deep woods and open fields, stopping to swim or picnic whenever you feel the need.